Prior to 2017, it was clear from our research and analysis of the market that we were faced with a congested calendar with too many media channels, information sources and boat shows, events and parties. If someone wanted to, they could read a different superyacht related magazine, book, blog or website every day of the year, while attending a boat show, forum, summit, symposium or conference. This has driven The Superyacht Group to now operate with the strategic mantra of “Less is More”, a decision that has proven to be appreciated and respected by the industry. The amalgamation of our portfolio into three core focused channels; The Superyacht Forum, The Superyacht Report and SuperyachtNews.com, ensures that our audience is reading the most valuable journalism and reporting in the sector. The strategy applied to our event portfolio, has created a more valuable platform for all sectors of the industry to meet, engage learn, exchange ideas and create valuable business opportunities. 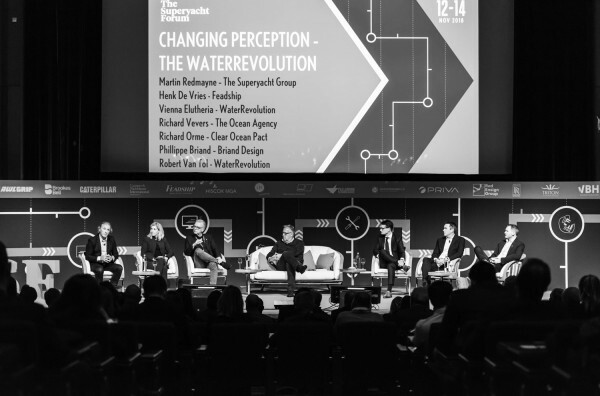 In 2017, The Superyacht Forum was introduced as a 4 day event, becoming an amalgamation of our previous in-house events: the Global Superyacht Forum, SuperyachtDESIGN Week, Make Your Mark, The Superyacht Owner’s Summit and Superyacht Management Meetings. For 2018, The Superyacht Forum programme was reduced from 4 days to 3 (as it was prior to 2017). We have reintroduced our London design event (The Superyacht Design Forum), so there will be less of a weighting on the design element. However, it will continue to explore the different aspects of our magazine: Operations, Technology, Design, Owner, Buyer, Fleet and Business. We are confident that by bringing together the shipyards, the strategic thinkers & marketeers, the financial, tax & business community, designers and the owner advisory network & family offices and the unique mix of experts to the existing community of the Global Superyacht Forum, we have created the most valuable and powerful meeting place for everyone involved in superyachts. Many future thinking or mature industries have an annual meeting of the most powerful players in the various sectors, who all come together for strategic meetings, policy discussions, ideas exchanges, innovation think tanks and essentially to explore the future of the market. It is our mission to grow on the success of our events portfolio and create a central annual meeting place for everyone involved in the design, build, operation, innovation, purchase, management and ownership of superyachts. Click here if you would like to register your interest for The Superyacht Forum 2019.